Interested in getting into graduate school? So was I. My problem was that I was rejected from three graduate schools the first time I applied. I have since been accepted into one of the schools that originally rejected me. During this process, I have learned a lot about how grad student selection tends to take place. I do not claim to be an expert on this topic, but I do feel that my experience and knowledge may be helpful to some people considering this life choice. Graduate school is a definite goal for many of us who are passionate about knowledge and study. It is important to keep in mind that the competition for admission can be stiff, as there are usually more applicants than available positions. The process of applying to grad school can be complicated and demanding. It is important to know what type of selection process is typical for your field and/or school. This approach to selection is common in non-thesis programs where you do not have a direct supervisor. These programs will often have a committee go through all the applications received. This group of people will analyze each applicant, rank them, and offer positions to the highest ranked people. In this case it is often impractical or impossible to get to know any of the people who will be selecting you. This relatively common process bears a lot of similarity to applying for a high-end job. As such, you may want to approach this application process much as you approach applying for a job. Your qualifications, volunteer experience and how you present yourself through words are of primary importance. Now I will talk about what I think of as the more traditional approach to graduate studies. This selection process is typical if your program has you being supervised directly by one or more professors. The professors are the people who are primarily responsible for helping direct you in your academic and research path. To a great extent you work for them and with them. Good supervisors seem to be a mix of peer and boss. The department might receive several hundred applications. They sort them into piles according to the sub-fields that are present in their subject area. For example, physics has experimental and theoretical sub sections, but it also has sub-sub-sections that are much more specific. A big department will end up with a number of distinct piles. For example, a professor in experimental condensed matter physics might directly receive only those applications that cite her/him as the proposed supervisor. Alternatively, they might be presented with, or have access to, the pile of applications that are for experimental condensed matter physics, maybe with the applications that cite her/him as the proposed supervisor on top of the pile. One of the key things to understand here is that a professor will only even look at applications if they are looking for a new grad student. It is possible that a professor might have funding available, but might feel up to the challenge of digging through a huge pile of applications. They have to keep in mind that they are essentially agreeing to pay someone a salary for a couple years. From just an application it is pretty hard to be sure that you will like a person, an important factor for supervisors to consider as well as students. Their quality of life also depends on the quality of their interactions with their grad students. As early as possible, talk to any professors that are doing research that interests you. If possible, talk in person. You might be working with them for years, and it is ideal if you can talk to them in person to see if they jive with you. This is a great opportunity to ask any questions that concern you with regards to the possible graduate work you might be doing. This is one fact that wasn’t actually that clear to me as an undergrad. At least in the Canadian universities that I have been in, professors are given direct grants for their research that they allocate at their discretion. If you are a student in such a department, your financial support is primarily through your supervisor’s research grants. How do I talk to professors? How to get it started? This is what I did at McGill in Montreal, Canada. My method was to walk up to offices that had their doors open and knock as I stood in the doorway. When the professor asks what I want, I would ask if they have a moment to talk to me about grad studies. At this point most profs either perk up and invite me in, or tell me that they are busy. When they are busy, I found most profs would usually give me a time that I might drop by when they are less busy. I found the professors at McGill to be very friendly. They were also very willing to talk about what work they and their group do. These people are generally doing what they do because they are passionate about it at some level. I also found that professors will be very up front with you about whether they have any open positions in their groups. If you can’t physically go to the graduate schools you are interested in, all is not lost. While email and phone aren’t as good as a face to face meeting, they are infinitely better than nothing. If you are dedicated with your efforts to contact people who you are interested in working with, then at the very least when they look through the applications directed at their department, your name might catch their eye a bit. A very likely result however is that by dint of your efforts to contact and communicate, you will rouse their interest in you as a potential graduate student. Even without face-to-face meetings it is possible to cultivate a relationship through which you can acquire a graduate position. The more technically savvy professors may also be convinced to give you some time via a Skype video conference as well. While even Skype isn’t as good as a face to face meeting, it does have a lot of advantages over email and phone, at least as far as actually getting to know your supervisor is concerned. As far as I can tell, this is the single most important facet for getting into graduate school under a particular supervisor. The most important thing is to start and pursue a genuine conversation who are doing things that interest you. Don’t be too timid, don’t be too overbearing, just talk to them. While the details of how you conduct yourself depend a lot on which medium you are using (in person, email, phone, Skype), I do have a couple tips. Do your homework on who they are and what they do. I’d highly recommend knowing at least a bit about what their research focus is before bothering them with a conversation and/or questions. You should be able to tell them why you are interested in working with them. What aspect of what they do interests you? Most professors have a personal webpage on which they list their research interests and/or publications. If nothing else works, you can look up their work on a academic search engine like Google Scholar. Feel free to introduce yourself in a way that seems to make sense to you with regards to your field. For me, this included telling professors that I had recently finished studies in Regina where I acquired four undergraduate degrees and am now interested in pursuing graduate studies in physics. Feel free to ask questions. Perhaps you are interested in hearing more about some aspect(s) of their research. Perhaps you want to learn more about what it is like to be a graduate student. Perhaps you want to know who their favourite musical artist(s) are. Ask whatever questions occur to you as being important enough to warrant them spending the time to answer them. This is your judgement call. The questions you choose to ask will say a lot about who you are and how you will approach your possible graduate studies with this professor. Start early. If you are planning to apply in a couple months, get going on this. It is woefully easy to procrastinate on, but it is the single most important factor for getting your foot in the door. If you want to do graduate work that excites and challenges you, start emailing professors today. I recently finished a fascinating read. 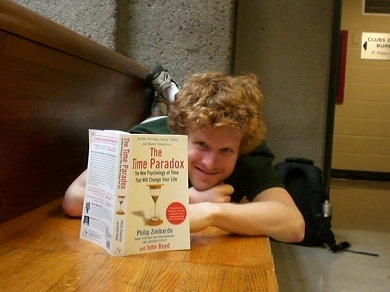 The Time Paradox is a book by Philip Zimbardo and John Boyd about how our personal perspectives of time have a tremendous effect on how we live our lives. You have have heard of Zimbardo before, he is one of the more famous social scientists in the world thanks mostly to his fame for conducting the Stanford Prison Experiment. He has written a major work on the subject of “Understanding how good people turn evil”. On the first page of my copy, he says that writing this book, The Lucifer Effect , was not a labour of love. I find this understandable; investigating the ways in which human beings can be turned evil is an extremely dark subject. I think the world owes Zimbardo thanks for pushing through the mire to discover how we can reorient our institutions towards bringing out the good in all of us rather than the evil. I had the pleasure of meeting Dr. Zimbardo briefly during his visit to Regina in November 2009. While I was pretty sure that his presentations would be good, I didn’t expect to be blown away by how caring and conscientious of a person he was. I observed him in person-to-person interactions far from the stage in which he was extremely kind, caring and patient with every person who asked him a question or for advice. I thought to myself, here is a man whose time is very valuable, giving it away to people because…well I hesitate to speculate…but I think he really just wants to help people. Even after a five-decade teaching career in prestigious universities, he still cares about people he meets on the street. I was profoundly moved by this experience. Now, back to The Time Paradox. Overall, this book was transformative and challenging. It lead me to understandings about my life, and the lives of those around me, that are profound and clear. I originally thought that I probably would not learn very much from the book, being a reasonably thoughtful metacognitive person. I turned out to be wrong, and this book fundamentally changed the way I look at the world. 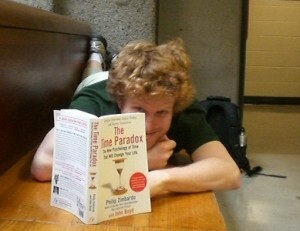 What perspective did I gain from this book? Time perspectives are important. A significant part of the book is dedicated to making clear just how important they are. What also comes along with that knowledge is a firm understanding of how far reaching the consequences of ignorance about time perspectives can be. Time orientation is a fundamental life perspective. Anyone reading this article of mine will have no trouble understanding the different ways of looking at time presented in the book. The perspectives in the book are roughly based on positive and negative views of the past, present, and future. The question for each of us is: Which time perspectives do you live, and how do they affect your life? Throughout the book there is a genuine respect for the fact that while social science can collect general data about the results of habits that people have, it cannot predict the outcomes for any one individual. The wisdom of this book must be applied by each person to their own personal context. Time therapy (applying the ideas from this book in the field of clinical psychology) seems to be incredibly powerful. However, for me the most important aspects of this book are those that have to do with each of us as individuals. Each of us lives our own journey through time, and this book is a good step towards understanding ourselves a bit better. There is no cookie-cutter solution to perspectives of life. The best answer is not any particular time perspective, but a combination of all. The authors espouse a very balanced time perspective based on the best data that they have. What does a ‘balanced time perspective’ mean? Well first of all it means that there is more than one time perspective present, because fixation on any single time perspective tends to lead to large problems in life. Fixation on only one perspective means you are missing out on a lot of your own experience and potential. Regard your future filled with quite a bit of hope, though tempered with the knowledge that you have to spend effort (and thought) now to create a better life for yourself later. Keep in mind your happy memories because they help you stay happy and live in a hopeful present, but keep enough realism about the past to learn from mistakes and hardships. Live today well, and be happy with the moments you have. Be aware of the central importance of the present moment. Everything happens now and no other time really exists except within our minds. We must live now, but we can also choose to shape our future and call to mind our happiness and lessons from the past. I scored the following on the Zimbardo Time Perspective Inventory. What are you? Take the test here. I needed to read this book. The insights I have gained from reading have helped me towards a more balanced and happy life. I firmly believe that this book has the potential to help others do the same. You can find The Time Paradox for a pretty decent price (and in several different formats such as Hardcover, Softcover, and Kindle Edition) on Amazon . In 2001, Doctors without Borders (or Médecins sans Frontiéres, MSF) approached the pharmaceutical company Bristol-Myers Squibb (BMS) to ask for a cheaper generic version of their HIV drug, d4T. The drug was available in developed nations for $1,600 per year per patient. However, MSF was trying to work in South Africa, and needed the drug to be affordable to make a real impact. BMS refused the request, saying that they required the money to support research and development of new HIV drugs. So MSF went to the source. A professor at Yale University, William Prusoff, was the discoverer of the d4T treatment. As is common practice, the university had sold the d4T licence to BMS, allowing them to distribute the product as they wished. It is for this reason that Yale, too, decided it could do nothing for MSF. Its hands were tied. At this point, BMS was aware of the negative publicity over the subject and changed their decision. Within a year the cost of d4T for South Africa was reduced by 96%. The drug d4T is no longer the preferred treatment for HIV in developed nations. However, in developing nations it is still part of the typical cocktail of drugs – thanks in part to its affordability. It is estimated that 2 billion people in the world lack access to life-saving drugs – that is one third of the world’s current population. In sub-saharan African, about half of the population lacks access. But lack of access to medicines is caused by many factors. As we see above, a major factor is Affordability, but of equal importance are Availability and Appropriateness. Let us look at each of these separately. In one fell swoop, the agreement (as of 2005) ended any manufacturing of generic drugs for cheap, local distribution, and increased the profits of patent-holding pharmaceutical companies. 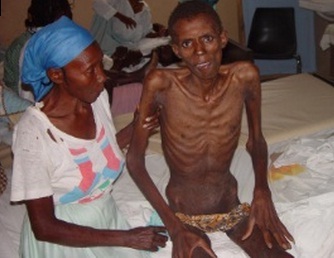 There have been cases where governments cannot afford to provide medicines for the needy in their country. These countries knowingly broke the TRIPS agreement to provide adequate medicines for their citizens. Some in return, as is the case with Thailand, were penalized via trade barriers with the United States. The Abbott drug company even withdrew its pharmaceuticals from the country. The medicine needs of the developing nations differ from those of the developed nations. For example, malaria barely affects the developed nations, whereas a malaria medicine is greatly needed in some developing nations. This is true for many other diseases, dubbed Neglected Diseases. But drug companies refuse to create new and/or improve old drugs for these diseases. The financial incentive is not there. What results is the use of old medicines with terrible side effects or even attempts to use animal formulas. Failing even these last-ditch efforts, the only course is simply NOT treating patients. Rachel Kiddell-Monroe was working with MSF in Rwanda. She was touring a local hospital when she was brought to a barred-off wing. Her inquisition into what was behind the barricade gave her this answer: people waiting to die. The patients behind the barricade were mostly HIV patients (without a proper diagnosis). She was struck by the knowledge that if these people were in one of the developed nations they would not be dying. Instead they would have access to the medicine they needed and would probably be leading normal lives. But all Rachel could do, along with the help of her crew, was sit with these people, holding their hands, so they could die with dignity. The issue in this case was a lack of appropriateness of the HIV drugs that had been created. Even if they could have been afforded, they would not fit the needs of the population. Most times the drugs make some requirement, e.g. that you take them with meals, three times a day. If you have no access to three meals of food, or even necessary drinking water then the drug may not work or even show adverse effects. Drugs, like so many other things, needs to be created with a context in mind. In 1999 Médecins Sans Frontiéres won the Nobel Peach Prize. With the money from the prize the organization started the initiative Access to Medicines. That initiative lead to the availability of the d4T drug mentioned previously, and continues to be a major player in providing medicines to those who need them. empower students to respond to the access and innovation crisis. The Access to Medicines debate isn’t just a hope for headache-remedying Tylenol, it is an issue of life and death. And life that is not just the avoidance of death but the opportunity for a truly meaningful existence. I like to read. This post is about how I have integrated more reading into my life. These tips vary in their applicability depending on your lifestyle and preferences. This piece is written from my experience alone. It is intended to highlight ideas that may help you integrate more reading into your life. Reading during other compatible activities. Make reading material more accessible in your home. Using audiobooks for reading while walking, running, folding laundry, etc. Skimming books and articles to see if they are worth reading. Read what you love. Read what you want to. Utilizing technology such as ebook readers and smart phones. I can bring a book to many places that I go during my day. I find that I often have a few minutes of ‘doing nothing’ at several points during my day. Some of these times I can fill with reading. I have found that reading can be done simultaneously with many other activities. What I focus on here is waiting, or ‘down time’ of different types. You might think that you don’t spend that much time waiting during your day, but I guarantee you that it can add up to quite a bit even for a busy person. Even a few minutes here and there means a few pages here and there. A few pages per day can mean an extra book or three per year. What do you do during these times? Perhaps you are idly staring off into space, or scanning the headlines of tabloids. If you are very performance oriented, you might find yourself stuck thinking circular thoughts about the time you are ‘losing’. Finding something productive to do during these times, such as reading, can help with both passing the time and stimulating new ideas and thoughts. I am not espousing that you begin to read instead of socializing. I am merely saying that you may have some alone time that you might want to spend reading. Some people swear by this technique. Having an interesting book at hand can be very helpful for integrating more reading into your life. This concept has been floating around for decades. North Americans watch an average of four hours of TV per day. If you would like to read more, but you find that much of your time is consumed by TV, a change may be in order. Find the book or books that you want to read the most, and use them as an incentive to drag you away from the TV some of the time. Put them somewhere visible such as on top of the TV or coffee table. You may be surprised about how engrossing a good book can be, especially if it has been a long time since you read for pleasure. TV is designed to grab and keep your attention so that you stay there, plastered to the screen between commercials (the primary revenue of TV stations). Books, on the other hand, rely on the quality of your attention and the fact that you care about what the author is saying. It is thus clear that books and TV shows become popular for very different reasons. I have recently become a fan of audiobooks. Audiobooks still come on tapes or CDs but these mediums are rapidly being replaced by the mp3 and other computer audio formats. When biking, though in traffic this can be a bit of a problem. Be sure that you don’t have the audiobook playing overly loudly, or it may seriously hamper your hearing (a very useful sense for an urban cyclist). When standing in lines or when shopping. When doing mechanical tasks around the house such as washing dishes or sorting laundry. In the last two years I estimate that I have used these techniques to read about 25 audiobooks. These have included such hefty titles as Atlas Shrugged and Guns, Germs, and Steel . 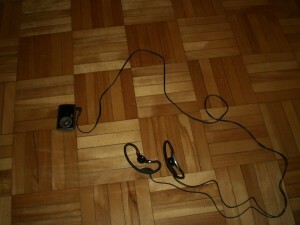 My Audiobook setup: Sansa Clip and Sony Headphones. The headphone design is great for walking, jogging, and biking. I have found this medium to be very useful, and I believe that it may be more socially acceptable for some people because of the growing popularity of headphones in public spaces. If you have a long commute on transit, but do not want to carry around a book, give audiobooks a try, you may be surprised by the results. If you want to make even better use of your time, you may find it helpful to increase the speed of your audiobooks. I routinely listen to my audiobooks at 1.5 times normal speed. Some of my friends listen at much higher speeds. 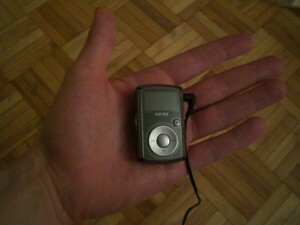 You can often modify the speed of playback on mp3 players or in computer software. If you wish to read non-book texts as audio, there are some text-to-speech converters available that may be able to help you transform the text into a mp3 or similar audio format. Be discerning about what you give your attention to. Not all books will be enthralling for you. If you find yourself getting bored or not learning anything new, don’t be afraid to skim (or just stop). For fiction books this might be a really bad sign, but for non-fiction is may just mean that the ‘meat’ of the book is elsewhere. I have been known to skim entire books in under 5 minutes while standing in a used book store. Sometimes a skim-through informs me that I want to buy the book and read it. Sometimes it tells me that I should read the final concluding chapter that knits together all the topics of the entire books. Sometimes it tells me that I should put the book down and look at other things. Skimming is more difficult with topics that are new to you, or especially complex. I find that if I have read a lot on a topic, skimming can be a powerful tool for discerning the quality of a possible read. If you are reading for fun, don’t waste your time on things you don’t enjoy. This may sound straightforward, but I find a lot of people start reading things ‘for fun’ that they don’t even enjoy. If you really want to read for fun, go spend an hour in a bookstore skimming through some books to find an author who has a voice and a topic that you appreciate. Don’t place heavy restrictions on yourself. What would I classify as a restriction? Here are some habits and beliefs that I would consider restrictive with regards to reading. I must finish all books I start. I can’t read for fun because I have too many textbooks to read (or work books, paperwork, memos, stock reports, post-its, etc). These new electronic devices allow increased mobility of information. It is possible to carry many ebooks on a single device, which itself may be smaller than a book. These devices are developing rapidly, and already offer what I would call an impressive reading experience. They are trendy and slick, and may be just the thing for getting more reading into your life. These devices are often multi-use, meaning that they may be useful for much more than just reading. The downsides of these devices that I am concerned about are the fact that they often have relatively short battery life (a few hours), and they may have difficulty with wet or very cold weather. Choose a device that fits the usage patterns (and weather) that you expect. I hope that some of these ideas prove useful for you. If you have further ideas you would like to share, I invite you to comment!